The Lectionary Readings for this weekend are so powerful, we can scarcely do them justice in a single blog post. Beginning with this Sunday, the Lectionary turns to the Gospel of John for the remainder of Lent. We are treated to the amazing trifecta of John 4, John 9, and John 11: three of the most powerful chapters in the most powerful book in the Bible, the Spiritual Gospel, the Soaring Eagle .... JOHN! The Church turns to these texts from John at this point in the liturgical calendar, because John is, in so many ways, a mystagogical document, a gospel intended to takes us deeper into the mysteries, that is, the sacraments. If one is not initiated into the sacraments, John remains in many respects a closed book. I can attest to this from personal experience.Although I have always loved my name-sake Gospel more than any other part of Scripture, I virtually never preached from it in my pastoral ministry. I was enthralled with the words and fascinated with the realities behind them, but wasn’t sure what the application was for texts like John 4 or John 6. The problem lay in the fact that, as a Christian outside the visible Church, I was only partially initiated into the sacraments. Not having understood the sacraments, I could not recognize when Jesus was speaking of them. The First Reading, Exod 17:3-7, recounts the famous incident in which the people of Israel almost stone Moses in their demand for water in the desert. God commands Moses to strike a certain rock near Horeb (a.k.a. Sinai) to supply water for their thirst. Of course, “Man does not live by bread alone,” in other words, our physical needs are not the definition of our truest nature. Extending the metaphor to thirst, we may also say, “Man does not live by water alone.” The satisfaction of thirst is not the ultimate answer for the human condition. The physical thirst of the Israelites in the desert is a sign point to a greater thirst, our thirst for God himself. David puts it this way: “As a hart longs for flowing streams, so longs my soul for thee, O God. My soul thirsts for God, for the living God.” The real thirst of the Israelites, whether they knew it or not, was for God himself. Interestingly, God would satisfy Israel’s thirst for himself shortly after this incident in Exodus 17. In Exodus 24, God would solemnize a covenant with the people of Israel, a covenant we usually identify as the "Old" or "Mosaic" covenant. After the covenant was formed, God invited representatives of the Israelites to dine with him on Mt. Sinai. “They beheld God, and ate and drank” (Exod 24:11). As Brant Pitre points out in his fabulous new book , the rabbinic tradition understood this text in the following sense: For the Israelites on Sinai, the vision of God was food and drink to them, i.e. they dined on the very sight of God. Be that as it may, Israel’s honeymoon with God did not last long. Shortly after the making of the covenant in Exodus 24, the same rebelliousness of Israel manifested in today’s First Reading reasserted itself at the Golden Calf (Exodus 32). Although God forgave His people, never again would they climb Sinai and dine on the vision of God. Today’s Responsorial Psalm (Psalm 95) recalls Israel’s rebelliousness in the desert and urges us: “If today you hear his voice, harden not your heart.” In other words, the same God who lead Israel through the Wilderness is still speaking to us now, today. Do not repeat Israel’s mistakes. Don’t fight against the God who is the only one able to supply your true desire. Of course, the water poured out for the Israelites in the Wilderness is a sign of the Holy Spirit, which is poured out for us primarily in the sacrament of Baptism. This leads us to the Gospel, John 4, the story of the Woman at the Well. This story is so full of nuptial images, it is difficult to explore them all. First, there is the very fact that Jesus meets this woman at a well. This happens three times in the Old Testament—it is how the Patriarchs met their wives. Think of Isaac and Rebekah (Genesis 24—although this betrothal was by a proxy); Jacob and Rachel (Gen 29); and Moses and Zipporah (Exodus 2). Conditioned by the Old Testament narratives, we actually expect a woman to show up as soon as Jesus sits down by the well, and so she does! 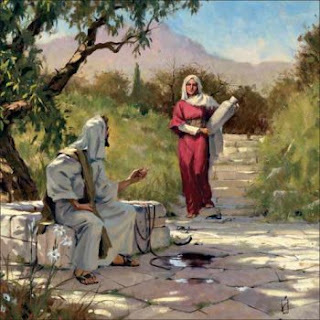 Next, Jesus asks this woman of Samaria for a drink. Take note: the request for a drink was the sign that Abraham’s servant used to determine if Rebekah was the divinely-intended bride for Isaac (Gen 24:14). (Interestingly, the only other place in the Gospel of John where Jesus will request a drink is at the cross). Jesus and the woman begin to discuss wells of water, and at one point Jesus says, “The water I shall give will become in him a spring of water welling up to eternal life.” This is a subtle allusion to Song of Songs 4:15, where the Bridegroom calls his Bride a spring of living water. When we receive the Water of Jesus, we enter into a nuptial relationship with him. But the woman’s personal history is an icon of the history of her people. She is a woman of Samaria, after all. The Samaritans were mixed descendants of the poor people of Northern Israel (left behind by the Assyrians in 722BC) and five foreign nations brought in by their conquerors, with whom the Israelites intermarried! This intermarriage was not merely physical, but also spiritual, as they worshiped the foreign pagan gods. (See 2 Kings 17, esp. vv. 24-34. Keep in mind that the author of 2 Kings downplays the role of the Israelites left in the land, whose presence we know about from other sources). Then, after Judeans returned to Jerusalem in the late 500s BC, the northern Samaritans bit by bit gave up the worship of other deities and returned to worshiping YHWH God of Israel, but they did not do it according to the covenant with David, whereby Jerusalem was the place of worship (see Psalm 132). They built their own temple in Gerizim (mentioned in John 4), and tried to be in relationship with God without following the proper form of the covenant. What do we call it today when people live together, but are not in proper covenant relationship? See the connection with John 4:18? The woman’s experience mirrors that of her people. The people of northern Israel, her ancestors, left their husband-God all the way back in 1 Kings 12 (see also Hosea 1-3, all oracles directed to Northern Israel!). Now YHWH, the Bridegroom of Israel (Hosea 2:14-23!) has returned to woo the people of Samaria! The Fathers saw the connection between Baptism and our nuptial relationship with Christ. In early Church catechesis, Baptism was likened to the nuptial bath that one would take before going to the wedding feast (the Eucharist, see Catechism §1617). If the readings this week creates in us a nostalgia for our own Baptism, it is a good thing. We do not need re-baptism, however, to awaken the Spirit and graces that were given to many of us so long ago. The sin has dried up the living waters, it is a good week to schedule an appointment for Confession, that other Sacrament that Fathers and Doctors regarded as a kind of renewal of Baptism. The material in this post and much more is on my CD set on John, available here. Perhaps the best single essay on the Gospel of John is Scott Hahn’s "Temple, Sign and Sacrament," available (incredibly!) as a pdf by clicking here. 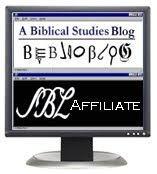 If you want to visit some of the locations in the Gospel of John, come with me in May by signing up at this website. The Most Aggressively Inarticulate Generation?